Sometimes a pair of extremely similar builds hit the Hackaday tip line within hours of each other. We’re not one to play favorites, so here’s two projects that put RGB LED strips in a desk and workbench. [Charles] over at The Makers Workbench has long needed a lighting solution for his workspace. Flourescent lights are alright, but for real geek cred nothing but LED strips will do. He picked up an RGB strip on Amazon for $20 and now has a lighting solution that’s able to change colors above his workstation. Check out the video of his RGB workbench rave. A computer desk is a workbench too, right? [Will] had the idea of letting people on the Internet control the lighting color of his desk. He’s asking people to head over to this site and asking people to schedule the color of his desk for an entire day. A Raspi pulls each day’s color off the server. With a few transistors, an RGB strip, a custom shield, and faking three PWM channels, [Will] has a new color at his desk every day. That was annoying. The site asks for your email which is easy to put filler in but still one strike. From there every time I tried, the date was taken. After a few days of blocked, jumped months, then even years. I think I got some time in 2017. Not showing what dates are available and making guests keep submitting over and over, strike 2. There’s a calendar which shows you what dates are taken, find an empty spot and bam. I found several in September 2013. Email is probably so that you can’t do duplicates or have a bot come and fill the form with crap. Calendar did not work for me, just showed a blank page. I tried to schedule any Tuesday from now through October and failed – perhaps demand was under-anticipated and a whole day is too much. But the idea is good fun. Yep, who really needs color recognition at you work bench. I went with RGB simply because it was cheaper than pure white. Using an rgb source, things will appear with slightly false color. White Leds are much better than having 3 spectral peaks, although they usually lack somewhere in the turquoise region. Seriously? They lack in the reds and have too much blue/green. Their initial physics use royal blue LED with lots of UV to react with phosphors mounted to the diodes, using the UV to convert to the visible spectrum. As a follow-up, I see that it’s a darlington NPN. Still, it looks like, at saturation, the current will be around 41mA. Anybody have an idea what the GPIO is rated for on the Pi? Well, I am pretty sure is much less than 41mA. PICs and AVRs are rated for 20mA and that is a lot for a microcontroller already. The only ICs I know can supply 40mA without any problems are 555 timers. AVRs can often sink up to about 50ma. I use them to drive reed relays directly. There actually might be some kind of context-aware use for a workbench with colored lighting. Using properties of additive (from a light source) and subtractive (from a paint source) color mixing, you could establish some workflow and then when you reach up to grab a tool, the bench shifts from white to some color to highlight labels on the tools that you’re most likely to use. 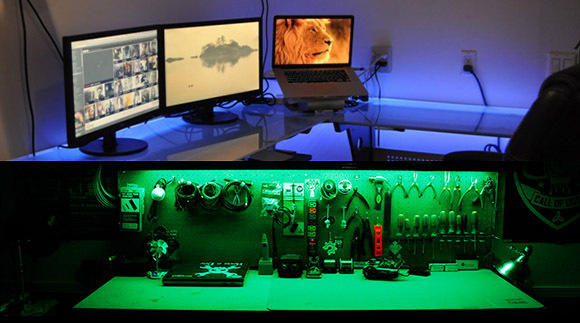 Add LED strips to your work bench and end up on hackday. Great project for kids ages 3-7.